Looking For Great Mexican Food Recipes? 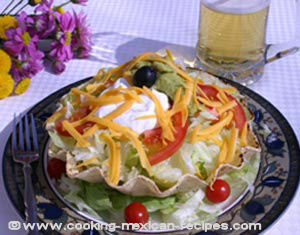 If you are a Mexican food lover, you’ve come to the right place in your search for Mexican food recipes. Seriously, I get great satisfaction serving people great food. Still do in fact. And that’s why I created this site. I can’t exactly serve you up some great Mexican food but I can do the next best thing. I can share my Mexican food recipes with you and show you how easy they are to make with detailed instructions. I’m including more how-to cooking videos all the time to make it easier for you to make my recipes. You will also get the benefit of the knowledge I’ve gained from working in the restaurant business. My goal is to bring you quality recipes that you will want to refer to again and again. The art of enchilada making. How to best soften, fill and roll enchiladas. I’ve got a great Mexican beef recipe to fill those enchiladas too. Would you like some Mexican food recipes for refried beans and rice? I have found many to be a bit bland. I’m going to show you my little secret on how to get the most flavor into your refried beans without using unhealthy lard or bacon grease. My Spanish rice recipe is easy, healthy and most importantly full of flavor. Don’t miss my chile verde recipe. It may take a few hours to simmer but this tender pork stew will tickle your taste buds. We’ve got a few Mexican food recipes for appetizers worth checking out. Start your meal with some velvety guacamole, warm Mexican artichoke dip, chicken quesadillas or Mexican cornbread to name a few. How about a Mexican breakfast recipe? I’ve got a delicious egg, cheese, and chile casserole you might want to try out. Did I hear you say salsa? Talk about a healthy dish. Yes I have a few salsa recipes for you to try, with more coming in the future. I also don’t want you to miss my most favorite dish I used to make when I was working in the restaurant. If you love tostadas check this out. You’ve never had one like this. I also have a few kitchen tips for you. Want to learn how to get onion and garlic smell off your hands? Check out my cooking tips page for useful tips in the kitchen. Need help with doubling or halving a recipe? I have a page for measurement conversions to help you out. You will notice some health tips sprinkled throughout this site. After I hit 40, I started getting more conscious about what I put in my mouth. and how my food is prepared. I will be including health tips you might find interesting and helpful. I am going to have you eating good and healthy. If you want to see, at a glance, all my Mexican food recipes, click on the recipe index on the left and you will find every recipe on this site. I also have a cooking blog you might want to check out. My entries cover just about anything related to food and cooking. I also post recipes, Mexican and others that my visitors send in to share as well as some of my very favorites. Don’t miss these little gems. Have a question, recipe to share, or a comment? Drop me a line. I’d love to hear what your favorite mexican food recipes are. In the mean time, have a look around. I hope you get inspired and try some of my Mexican food recipes. So throw on your apron and fire up the stove. We’ve got some cooking to do.